There's always a tension in decisions about purchasing medicines by the NHS. On the one hand, getting the best value for taxpayers. And on the other, allowing sufficient incentives for drug companies to do business in the UK. Right now, the UK's pharmaceutical industry - or "big pharma" - feels the balance has tipped too far. Trade body the Association of the British Pharmaceutical Industry (ABPI) believes that there is too tight a grip on NHS spending and that patients are being denied access to life-changing medicines. The industry has long complained about the National Institute for Health and Care Excellence (NICE), which decides which medicines and treatments are appropriate for the NHS to fund. 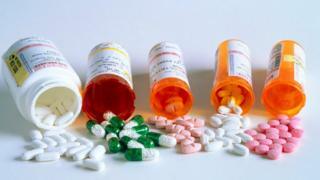 It claims that NICE rejects some drugs which are available in other health systems. But others, including Bill Gates no less, believe that NICE does a good job in helping control spending in contrast with constantly-escalating medicine bills in the US. What really angered the industry was the recent decision by NHS England to put a cap on budgets for new drugs - even if they are approved by NICE. If spending on any single medicine or drug gets to £20m, NHS England reserves the right to review it and bar further funding. Scotland has its own version of NICE, the Scottish Medicines Consortium, which can make different decisions resulting in some drugs being available north of the border but not in England. The NHS in Wales and Northern Ireland tends to follow NICE rulings. Put simply, the pharmaceutical industry feels unloved. It has now issued a thinly-veiled warning to whoever forms the next government - act on the concerns or lose out on future investment. Big companies are in effect asking why they should conduct drug trials in the UK - which NHS patients benefit from - when there is no guarantee that the finished products will be purchased. French and German patients, they argue, are five times more likely to receive new medicines in the first year of issue than those in the UK. In a globalised industry, jobs and research can be moved with impunity. Intriguingly, the ABPI has joined calls for more money for the NHS - advocating a hike in total UK health spending as a percentage of the economy to the average in leading industrialised nations. That would be equivalent to around £20bn a year extra. Cynics might say that pharma companies asking for more NHS funding is driven by self-interest. Their response is that curbs on NHS spending have left some drugs unaffordable and so unavailable to patients. Big pharma has sometimes ended on the wrong side of a financial argument. The then Prime Minister David Cameron set up the Cancer Drugs Fund (CDF) in 2011 to allow NHS patients in England access to drugs rejected by NICE. The move was, unsurprisingly, warmly welcomed by the pharma industry. Nearly 100,000 patients were treated thanks to the fund, but it consistently overspent its budget and struggled to keep up with demand. The CDF closed its doors to new drugs from October 2015 in the face of howls of anguish from the drug companies. They argued that patients would lose life-changing treatments. The fund has since been taken under the wing of NICE, which some believe is where it should have been all along. A new report by academics in the cancer journal Annals of Oncology argued that the CDF was not good value for patients and society. Most of the drugs in the fund, the authors say, failed to show any evidence of meaningful clinical benefit. Their conclusions were based on 29 drugs approved for use by the fund in January 2015. The ABPI dismissed the report as "sensationalist and misleading". Some politicians and NHS leaders will always be suspicious of pharmaceutical industry complaints at a time when they continue to report healthy profits. But whoever walks into Downing Street after polling day will have to think hard about relationships with a major British industry and how to cope with a rising patient demand for medicines from the NHS. Should the NHS have its own tax?